This is another of the Elizabeth Arden shadow duos from the 1980's that I was lucky enough to have unearthed last year. The packaging is the same at the other one I reviewed, so I won't repeat that. The packaging is still in pretty good shape - a bit scratched and no applicator, but otherwise it's in great condition. The shadows are soft peach and dusty lavender. They were a bit hard in the pan and difficult to swatch due to their age. I ended up having to give up on brushes and use my fingers. Once applied they were still quite pretty! Swatches below are on bare skin. Urban Decay's Pocket Rocket glosses are best known for their photos of attractive men who present themselves in various states of undress depending on the angle of view. They also happen to be pretty nice glosses. The case is a generous size, in a flattened oval shape. The applicator is a soft, short brush. The gloss itself is a somewhat sticky gloss with decent staying power and light to medium pigmentation. The color is a a slightly browned dark purple. I don't care for it alone, but I like using it to tone down too-bright lipsticks. Pale Plum is the third lipsticks from Bobbi Brown's Marrakesh collection that I'm going to present here, and it's my favorite. It has the Creamy Lip Color formula, which means it's lightweight with medium pigmentation and a reasonably moisturizing formula. Wear time is decent but not as good as the Rich Lip Color or Bobbi's standard semi-matte lipsticks. The case is standard Bobbi Brown: black plastic with Bobbi's name on the side. It's a slimmer case and bullet than the Rich Lip Color. The color is a perfect natural and neutral dark dusty pink. 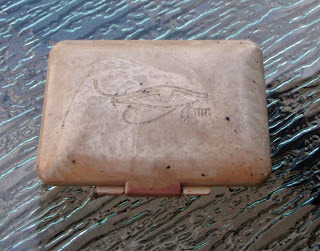 This Merle Norman compact is one of the first eye shadows I ever bought, around 1980-81. 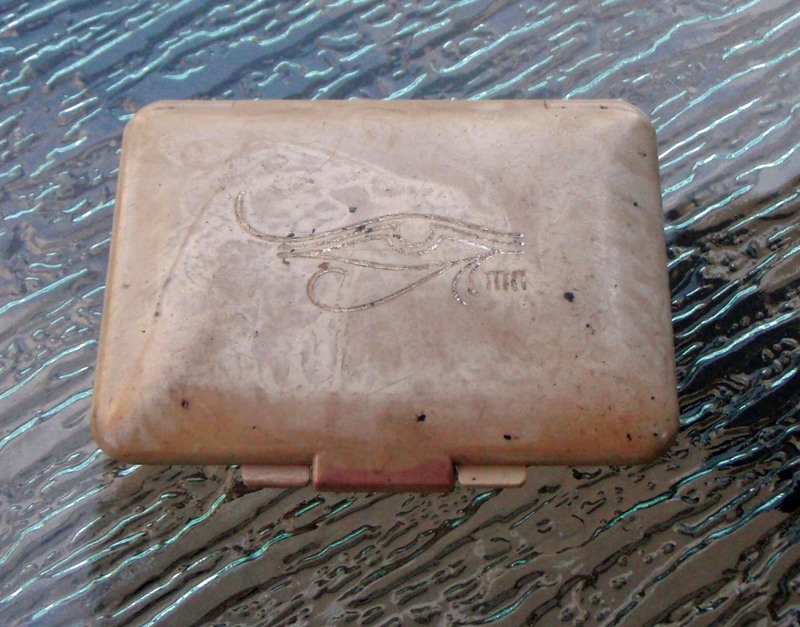 The case is marbled taupe with an engraved Egyptian-style eye and the initials MN on the front and a sticker with the product description and an approximation of the color on the back. Inside is a generous .1 oz of pressed shadow. It goes on a little thin and patchy, but that wasn't the case when it was less than 30 years old. The swatch in full sun looks rather shiny, but that's just a trick of the light. In reality, it's a lovely and versatile matte taupe. Pink Blossom is another one of the lipsticks included in Bobbi Brown's Marrakesh collection. It has the Creamy Lip Color formula, which means it's lightweight with medium pigmentation and a reasonably moisturizing formula. Wear time is decent but not as good as the Rich Lip Color or Bobbi's standard semi-matte lipsticks. The case is standard Bobbi Brown: black plastic with Bobbi's name on the side. It's a slimmer case and bullet than the Rich Lip Color. As you can see in the swatches below, this is a pretty, neutral-to-cool pink that looks nice on me but might be too light for a darker complexion. Desert Rose is one of the lipsticks included in Bobbi Brown's Marrakesh collection. It has the Rich Lip Color formula, which means it's lightweight, highly pigmented, and while it isn't drying it isn't moisturizing either. Wear time is decent. The case is standard Bobbi Brown: black plastic with Bobbi's name on the side. As you can see in the swatches below, it's a nice neutral pink that could be used in a variety of looks. This lovely eye shadow duo comes in a heavy white plastic case with a raised Estee Lauder logo on the top and a foiled sticker on the bottom. Inside are two .06 ounce eye shadows and a shallow well which once contained an applicator. The shadow on the left, which I'm guessing is Misty Lilac, isn't lilac at all. Instead it's a lovely peach. On the right is (probably) Violet Smoke, a pretty grayed lavender. The shadows are a bit dry but applied okay on bare skin. They aren't perfect, but given their age I think they're doing pretty well. I probably bought these in the late 1980's, but it could possibly have been as late as the early 1990's. For the time they're pretty tame and are still quite wearable shades.